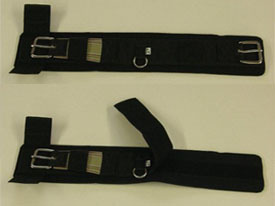 These girths have Airprene liners. Explanation of Airprene - neoprene with Jersey fabric on both sides so the girth does not grab the hair when the hair is dry. 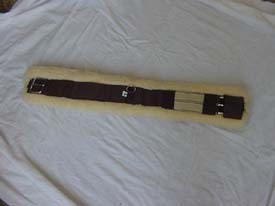 The life of the girth is greatly enhanced because the neoprene is not exposed to the UV rays. The Airprene has little air holes all through it so it can breath. No heat build up like you get from regular neoprene. Very easy to take care of, just slosh in a bucket of water and the sand and dirt will rinse right out. Fast drying. Felt, fleece or Airprene attaches to nylon body with Velcro and can be removed easily for washing or replacing. All stainless steel hardware. Use on our custom Endurance saddle or can be used on saddles with western-style rigging. Please measure your old liner from end to end for selecting proper length to be made.